The board of advisors of the Eastern Band of Cherokees Community Foundation announces $1,520 in a local grant award from its community grantmaking fund. This year’s nonprofit recipient is Cherokee Cancer Support Group. 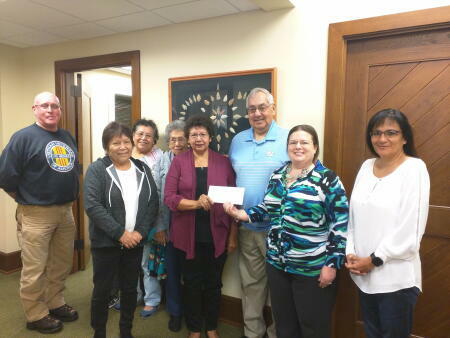 This group works with tribal members diagnosed with cancer by providing assistance with gaining medical resources and financial support for treatments. Not only that, but this volunteer-led nonprofit works with their clients to show them that they are not alone in their diagnoses. Many of the volunteers have either had cancer themselves or provided immediate care for someone who did. They assist and promote healing by sharing their own personal experiences. The funds given by the EBCCF will be used for general operating support. Cherokee Cancer Support Group board members and volunteers attended the recent board meeting of the Eastern Band of Cherokees Community Foundation to share stories about their organization and accept their grant award.